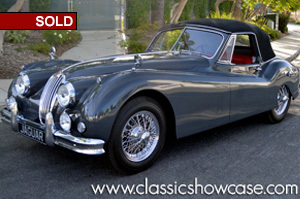 (SOLD) This is one of four special Jaguars from a private La Jolla, CA collection, never offered before. This beautiful, no expense spared, restored, matching numbers XK-140 MC DHC was an off the body restoration done by Jaguar professionals. The restoration of this vehicle to Show level included the following: the vehicle was stripped with all body parts fitted to the car and chrome, prepared for primer, sealer, paint, color sanded and buffed to a fabulous finish. Mechanical systems and components have been gone through, restored or replaced as needed. The engine has been rebuilt, as well as the rear end and suspension. The carburetors and clutch system were rebuilt, and an all new hydraulic system was added, with shocks serviced as needed; the chassis and many other parts were refinished in their correct finishes, new suspension bushings, new fuel pump, all electrical components, instruments, gauges, knobs, switches rebuilt or replaced, seat frames restored. All other systems, such as the electrical, hydraulic, cooling and fuel system have been restored or replaced; the car received all new rubber and seals, and a new wire loom. All britework has been re-plated or replaced as needed. This car received a completely new interior and has only a few test miles since the restoration. One of 14 factory built with wire wheels and spats. Appointed with beautiful wood and chrome that makes it elegant and classy, as well as sporty with all the performance it has. She has gotten her toes wet in the show circuit, with winning Best of Class and Best of Show in the San Diego JCNA concours held July of 2017, where she scored 99.92 points in her first showing! Her dowry includes concours tools, restoration photos on a CD, the original ID plate, a front license plate, keys (original and extras), a Heritage Certificate, a hammer, and her owner’s manual. She is ready to be shown, driven, and admired by her next discerning Jaguar collector and continued campaigning on the show circuit. The Jaguar XK140 is a sports car manufactured by Jaguar between 1954 and 1957 as the successor to the XK120. Upgrades included more interior space, improved brakes, rack and pinion steering, increased suspension travel, and telescopic shock absorbers instead of the older lever arm design. The standard XK120 was followed up with “M” and “MC” versions (Modified and Modified, C-Type head) also known as SE in other markets. These high-performance variants boosted horsepower from the standard 160 bhp to 180 bhp and 210 bhp respectively. The XK 140 was introduced in 1954 with major changes in appearance and engineering. Externally, the classic lines were retained but were protected by sturdier bumpers to give better protection, both front and rear. From the rear, the basic lines were remained, but the finish features were completely restyled. Although the external appearance of the XK 140 was significantly altered, the major changes were mechanical. The most important change was the repositioning of the engine three inches forward on the chassis. This not only afforded additional passenger room, it also provided space for the battery in the front fender well, thus freeing the area behind the seats for a jump seat and/or additional storage.